Forage makes up between 50 and 90 percent or more of a horse’s diet. Much of the forage part of the diet comes in the form of hay. Because it’s such a big part of the ration, a good quality hay can help keep a horse healthy, while a poor quality hay can be detrimental. This is why, as nutritionists and horse owners, we put a big emphasis on the quality of hay we feed. The nutritional value of hay is the most important factor when determining its quality. This begins with the stage of plant maturity at time of harvest. Young, immature plants contain more nutrients than older, stemmier plants. Though after hay is harvested, the level of horse hay quality goes beyond the age of the plant at harvest. Think about the leafy greens you eat. You likely prefer greens with leaves rather than just stems. The same is true for your horse. Look for more flat leaves in the hay and fewer round stems; this indicates the plant was less mature when cut. More leaves typically mean higher digestibility and nutrient content for your horse. Stems smaller in diameter or finer are also indicators of higher quality horse hay. Small stems mean the plant was less mature when cut. To test stem size, grab a handful of hay and give it a squeeze. Good quality hay is soft and pliable, and feels good in your hand. If it feels like you’re squeezing a handful of sticks, it is not a good choice of hay to feed your horse. No matter the species of plant, hay with little to no seed heads or blooms indicates a younger, early maturity plant, and thus a higher quality hay. For example, timothy hay should be cut in the pre-bloom or early-bloom stage when you see little to no seed heads; and alfalfa should be cut when you see few to no blooms. On our farm, there’s nothing like haying season. We love the smell of fresh hay. The same is true for your horse. Good quality hay should have a fresh cut smell and appearance. Avoid musty, moldy or off-setting smelling hay, because it can reduce palatability and indicate poor quality. Hay should be primarily made up of the harvested forages. Look for a clean forage with little to no dust. Even if the majority of the hay is high quality, hays containing dirt, mold, weeds, trash or other foreign materials indicate poorer quality hay and may be unfit to feed to horses. Good quality hay should be bright green in color with little fading. A bleached, yellow, brown or black color may indicate aged hay, mold or poor storage conditions. Storage condition and age have a significant effect on vitamin content of hays. Many vitamins, such as vitamins A and E, are not stable over time and lose biological activity. After approximately six months, almost all vitamin A and E activity levels are lost. The nutritional value of hay is compromised with increased exposure to heat, sunlight and rain, which speed up this process. 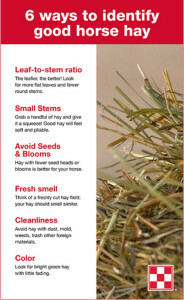 When good quality hay for your horse is scarce or too costly, you may need to compensate for poorer quality hay. You can do this by supplementing with a quality balanced horse feed. Hay balancers help provide the missing essential nutrients the horse requires in the diet. In some cases, they can replace hay in the diet entirely. Feeds like Equine Junior®, Equine Adult®, Equine Senior®, and Omolene #400 Complete Advantage offer built-in forage for situations where hay is not available in a horse’s diet. This entry was posted on Tuesday, October 23rd, 2018 at 12:33 pm	and is filed under News & Updates. You can follow any responses to this entry through the RSS 2.0 feed. You can skip to the end and leave a response. Pinging is currently not allowed.